On Tuesday, Mayor Greg Nickels delivered his annual “State of the City” speech, during which he touted his intention “to make Seattle America’s green building capital.” And here’s the plan: appoint a panel to develop a strategy to reduce building energy use by 20%. Meanwhile, two Los Angeles City Council Committees just voted (registration required, or see also here) to adopt an ordinance requiring all new construction over 50,000 square feet to meet the LEED Silver green building standard. And yes, that includes privately owned buildings. The ordinance is expected to become official through a full City Council vote in a month or so. 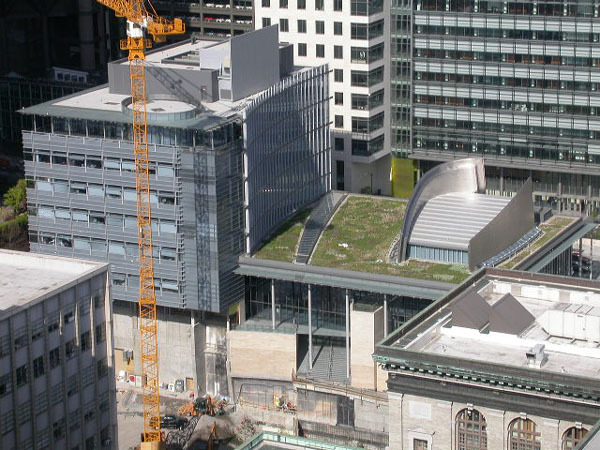 Lots of U.S. cities, including Seattle, now have LEED requirements for public buildings, but mandating LEED for private buildings is another story. Boston and Washington D.C. are the only major U.S. cities that have currently have green building code that regulates private development. LEED ratings apply not only to energy, but also to water, site, indoor environmental quality, recycled content, and construction waste. Data collected on completed buildings has shown that LEED-certified buildings are on average 25 to 30% more energy efficient than standard buildings. The ordinance that L.A. is adopting is likely based on the new ASHRAE 189 Green Building Standard, which is essentially a formal codification of LEED Silver. Well, it turns out that none other than John Hogan, Senior Energy Analyst for the City of Seattle, is the chair of the ASHRAE Standard 189 Project Committee. As I have written before, at this point in our history, allowing the construction of buildings that have not been designed for maxiumum energy efficiency is as irresponsible as sacrificing transit for new freeway lanes. Posted by dan bertolet on	Thursday, February 21st, 2008 at 11:14 pm. You can follow any responses to this entry through the RSS 2.0 feed. You can leave a response, or trackback from your own site. « The Result of No More Restrictions! To be fair, running through the actual documentation of a LEED building can be an expensive and time-consuming process. Also, Seattle’s energy code already beats Washington’s energy code which beats the national standard (ASHRAE 90.1). But then, California’s energy code is a bit better. The balance we need to find is a way to force builders to build resource efficient buildings without weighing them down with burocracy. Improvements in the energy code, along with additions to the building code might accomplish this. Looking at your link, it looks like this is the approach LA is taking. Ah, on this link it looks like they have another good idea – they’re “expiditing permits” for LEED silver buildings. Again, to be fair, Seattle is allowing LEED silver buildings to build higher than other buildings (see “density bonus incentive” here).